The Union Minister for Urban Development, Housing & Urban Poverty Alleviation and Information & Broadcasting, Shri M. Venkaiah Naidu launching the MyMSME App and MSME Facilitation Council (NMSEFC) Portal, at the Meeting of National Board for MSME to discuss the agenda of 15th Meeting of NBMSME, in New Delhi on April 27, 2017. The Union Minister for Micro, Small and Medium Enterprises, Shri Kalraj Mishra and the Minister of State for Micro, Small and Medium Enterprises, Shri Haribhai Parthibhai Chaudhary are also seen. Shri Kalraj Mishra, speaking on the occasion, said that Micro and Small Enterprises Facilitation Council (MSEFC) portal on http://msefc.msme.gov.in, would facilitate implementation of the delayed payment provisions of the MSMED Act 2006 and also assist in monitoring of delayed payment cases. This online platform is expected to be a significant step in the direction of Digital India from the perspective of the MSME Sector in the country. With the access to this platform, micro and small enterprises would be able to file their delayed payment related grievances online. The grievance filed would be communicated through email and SMS to the parties involved. It would also help officers of the Ministry of MSME as well as the State Government concerned in monitoring the progress of cases both at the State and National levels. He also informed that most of the States have already uploaded the information regarding delayed payment cases on MSEFC portal. As on 31.03.2017, 3690 cases involving an amount of Rs.1660 crore are being considered by various MSEFCs. In fact, the online portal would be of great help to start-ups since delayed payment is probably the single biggest problem for start-ups. In addition, the MyMSME mobile app on http://my.msme.gov.in, also launched by Shri M. Venkaiah Naidu, provides information on all schemes implemented by the Ministry of MSME at one place. The MSME units have had always been complaining that information on all schemes were not available at a single place. Such a compilation is certainly the need of the hour so as to ensure that entrepreneurs need not be searching multiple windows for help or information. With the help of MyMSME mobile app Ministry of MSME would be providing one single window to MSMEs to access information on all schemes implemented by the Ministry and as well as apply for any of them. 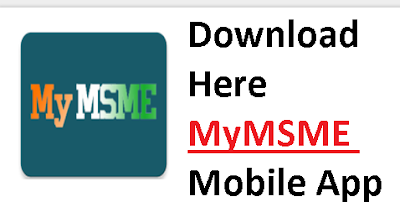 And MSMEs can also lodge grievances pertaining to Ministry of MSME through this app. Union Minister of State for MSME Shri Haribhai Choudhary stated that the Ministry has embarked on the journey to make every scheme online. He stated that MSME Internet grievance monitoring system has already resolved the grievances of more than 3000 persons. Shri Venkaiah Naidu, Hon’ble Union Minister for Urban Development, Housing & Urban Poverty Alleviation and Information & Broadcasting appreciated the efforts of the Minister in taking various initiatives towards ease of doing business in the MSME Sector in the country. He also congratulated Shri Kalraj Mishraji for taking steps in line with Prime Minister’s Digital India mission. Download Here MyMSME Mobile App: This online platform is expected to be a significant step in the direction of Digital India from the perspective of the MSME Sector in the country. With the access to this platform, micro and small enterprises would be able to file their delayed payment related grievances online.